Flight times from London to New York could be slashed to just 3 hours 15 minutes by 2025, if plans revealed by Boom Supersonic plane go ahead. The firm has previously revealed that initial test flights for its 1,451mph (2,330kph) aircraft, nicknamed 'Baby Boom', will begin by the end of 2018. 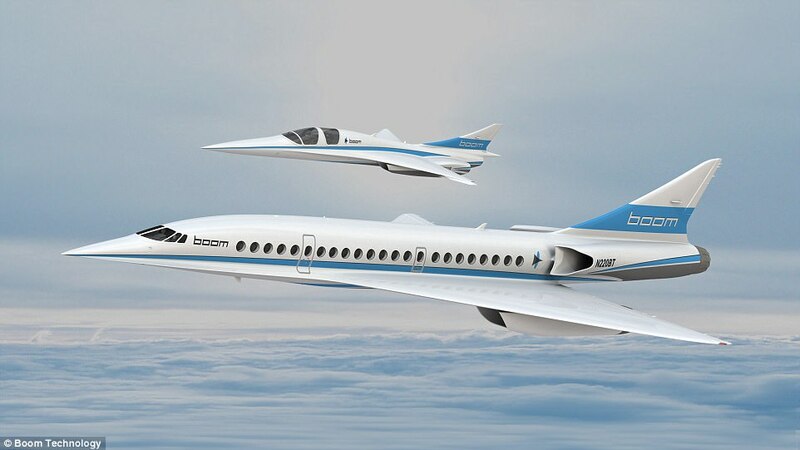 And now Blake Scholl, founder of Boom Supersonic, has revealed that commercial flights on the full-sized, 55-seater aircraft which is 'better than Concorde', could begin running by 2025. The full-size boom aircraft is expected to reach speeds of more than 1,687mph – 100mph faster than the infamous Concorde. Mr Scholl was speaking at the Dubai Airshow this week, when he revealed the latest details about the Boom Supersonic aircraft. The news comes just months after Mr Scholl revealed that a smaller version of the plane, called the XB-1 will be tested next year. He also said that Boom had already received 76 orders for its passenger plane from five unnamed airlines. The airline tycoon confirmed that Virgin has options to buy 10 of the supersonic Boom jets. 'Sixty years after the dawn of the jet age, we're still flying at 1960s speeds,' said Mr Scholl. 'Concorde's designers didn't have the technology for affordable supersonic travel, but now we do. The Boom jet was created by top aviation experts with collective experience working at Nasa, SpaceX and Boeing. The prototype has been subjected to more than 1,000 simulated wind tunnel tests and features a tapered carbon fibre fuselage, and efficient turbofan jet engines. In March, Virgin told MailOnline Travel: 'Richard has long expressed interest in developing high speed flight and building high-speed flight R&D through Virgin Galactic and our manufacturing organisation, The Spaceship Company. It will be split into two single-seat rows, so everybody has a window and an aisle.